First off – New ships and updated ships. Saladin, Saladin II, Siva, Siva II, Cochise, Cochise II and Jenghiz. If you’re not interested in a lengthy blog – just take a gander and let me know what you thing. I’ve re-drawn everything but the Jenghiz, so hopefully you all enjoy it. The rest of this blog post has two parts: First – why so many versions of what is essentially the same ship? Second – how all these versions tie together. Ok – preliminaries over; let jump into the meat of it! To understand WHY we’re doing so many versions of the same damn ship requires a bit of a history lesson. Back in the day, when the internet was new, computers didn’t really have flash drives and CAD drawing was the only real way to even attempt to draw ships for ANY space genera with any real decency. Home computers were expensive, the drawing programs were even MORE expensive and even scanned hand drawing wasn’t prevalent. The long and the short of it was that whenever there WAS art or designs, you latched onto them and made as many versions as you could. The Saladin class by Franz was the perfect example. There were essentially three versions of the same ship. And since (back then) you wanted as many variants as you could possibly create, the STSTCS group decided to make all three sub-classes essentially different ships. (We did this with several designs, actually.) Since then – technology has EXPLODED. Computer geeks aren’t just ‘coders’ anymore. They’re designers, gamers and most notably graphic artists. And the traditional graphic artist is now more present online than ever before. Just this single basic design idea – a single hull with a single engine – has HUNDREDS of variations, from the poorly drawn to the nearly CAD-like graphic. And there are dozens of minor variations among these designs as well. Different bridge module, different weapon placement, different engine style, different docking ports…and that’s just scratching the surface. Going forward, it would be great to have many of these designs created as FASA ships – but the reality of it is: you can only have SOOO much. There are only so many variations you can design without fundamentally changing a design. While a cool “look” is always fun, the reality of it is that Star Fleet would not build 74 different LOOKING versions of the same ship… We try to explain the variants by commenting on differences internally; for example – perhaps the labs were all clumped together, or the reverse – each was isolated in a different section of the ship. Crew quarters were made extra roomy or are particularly cramped. 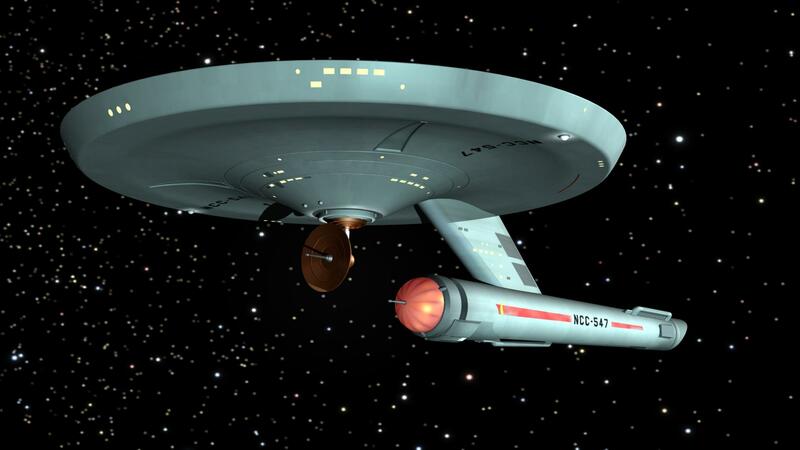 Perhaps the coolant for the phasers is all in one huge tank near the weapon, or was broken up into two, three or four smaller tanks and placed through the hull. Main power was in a single “cable” down the center of the ship – well protected and easy to fix, but difficult to replace when it WAS damaged. Or perhaps it was a number of distribution nodes at various points. Each is more vulnerable, but provides redundancy. Those are just a few of the example we’ve tried to use to help justify the HUNDREDS AND HUNDREDS of variations on a theme – especially for the Federation! But even with dozens of similar explinations, again – you can only get so far. I’m hoping in the future to write a full article on ship design for the FASA universe that will touch on these challenges – so stay tuned! Instead of talking about ALL the variations on a theme for all the ships out there – I wanted to give anyone who is interested a look into MY opinion of the Saladin style of single engine ship. As stated above, we wanted each sub-class to be different primarily due to the face that back in the day there were NOT a lot of different ships out there. We came up with the idea that each was launched a few years after it’s predecessor and incorporated new design ideas. For these three TOS style ships, we wanted to make sure that FASA’s Larson wasn’t outgunned and that ALL three versions were ready for the Four-Year’s War. When I went to transfer them to the NEW site – I realized that a minor bit of drawing would be necessary – make each on ever so slightly different. My thought process went a little like this – the Saladin was launched and served from the 2240’s into the 2270’s. It was then refit to the Saladin II – essentially being “modernized” like the Enterprise class. These would stay Class VII, while one was enlarged to a Class VIII…the Jenghiz. After 10 or 15 years, the Saladin II would all eventually be refit to the Jenghiz class. Somewhere along the line, a number of these would be upgraded to the Loki class destroyer. While this wasn’t the perfect answer, I really felt that it DID give us a nice set of ships – each a little different and each allowing for a slightly different effect during game play. It also kept Franz’s work and incorporated Eric’s material while tipping-the-hat to all those folks who had done their own version. Now I realize that not every redraw, update or graphically similar ship can be so easily tied together…hell – even THIS style has a massive number of variant redraws and new design ideas. But I think that as long as fans and artists don’t go TOO overboard, this kind of creative writing can help tie a LOT of thing together and give us an ever increasing fleet with minor variants to help make game scenarios more interesting and fun. Previous Article← Captains Log. Stardate…er…um. Good write up and have to agree with what you have said. “We have a new enemy…Luke Skywa…” WAIT A MINUTE!